As a major part of your exterior, your siding can make or break your home’s appeal. Your home may have a stunning roof and elaborate windows, but if its siding is peeling or warping, then its charm could suffer considerably. That’s why it’s important to keep your siding in good shape through regular maintenance. If repairs, however, are not enough to keep it looking great, then replacement will be necessary. Home style – Many homes today feature unique shapes and designs that cater to the personal tastes of homeowners. 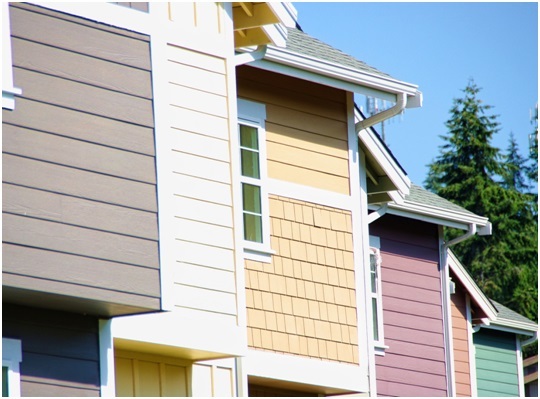 To pick the right siding color for your home, you need to take your home style into account. For instance, if you have stones in most of your structure, you can use multiple shades of blue and gray to complement your style. Location – You can also take cues from your natural surroundings. A wooded area, for example, suggests a combination of green, brown, and gray hues, while an ocean suggests complementary colors. Our CT vinyl siding are among the most versatile in terms of color combinations. Turn to our experts to suggest the right palette for your home. Balance of Color Choices – Even if you pick the best colors for your siding, they will not be enough if you apply hues that clash or mismatching shades. Be sure to strike a balance between your color choices. If you have a brightly colored garage door, it would be best to use a darker shade for your horizontal vinyl siding. Vinylume is the premier provider of quality vinyl siding in the region. Backed by over 60 years of collective industrial experience, we can install the best siding for your home. Our experts can recommend the right options according to your home style, location, and preferences. To get started with your project today, call us at (866) 244-8029 or fill out our contact form.